A precision-machined tool to accurately hold a pinewood derby wheel in the chuck of a drill. 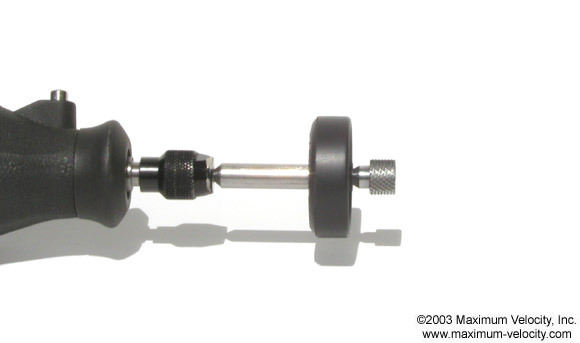 The Pro-Wheel Mandrel includes a beveled thumb screw to simplify and improve accuracy when mounting wheels. 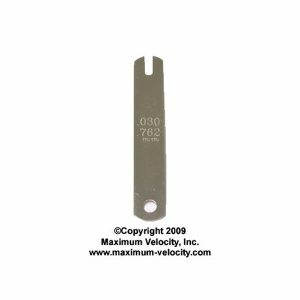 Accurately machined shaft allows for precision use in any drill chuck or Dremel-type tool. Step-down on shaft allows BSA wheels to be mounted with the 'spokes' facing the drill chuck, simplifying work on the inside edge of the tread. 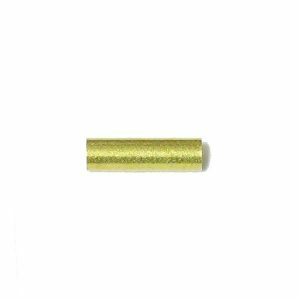 Knurled thumb screw eliminates the need to use a screwdriver to mount a wheel (a clumsy operation with the standard mandrel). Beveled thumb screw ensures that the wheel mounts accurately on the mandrel. Screw can be replaced should it be lost or bent. 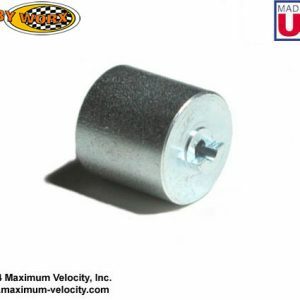 The Pro-Wheel Mandrel fits most brands of pinewood derby wheels, however, some wheels are equipped with a wheel bore that is slightly smaller then the mandrel screw. 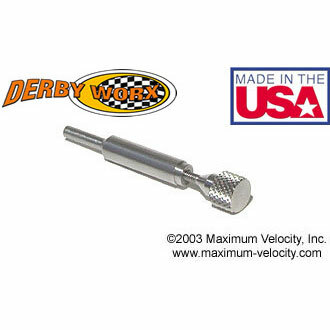 The Pro-Hub tool can be used to ream out the wheel bore so that it fits on the screw. 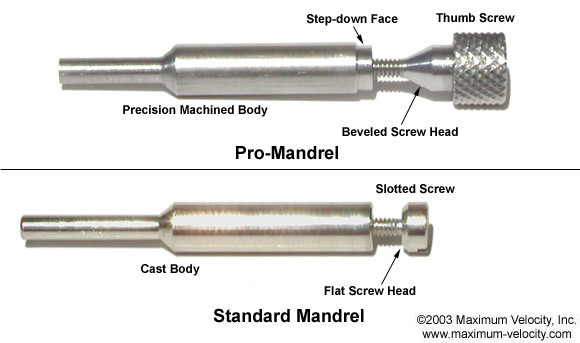 The picture below compares the Pro-Wheel Mandrel with the standard wheel mandrel. 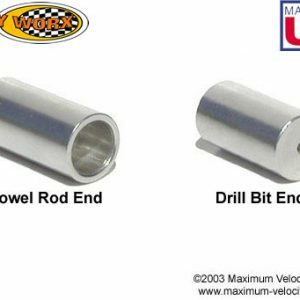 "No pinewood derby toolkit should be without the Pro-Wheel Mandrel. From simply polishing the tread surface to more serious tread work, the Pro-Wheel Mandrel is indispensible." Caution - Wear eye protection while using this tool. If using a Dremel-type Tool, use the lowest speed. Mount the mandrel in the chuck of a rotating tool. 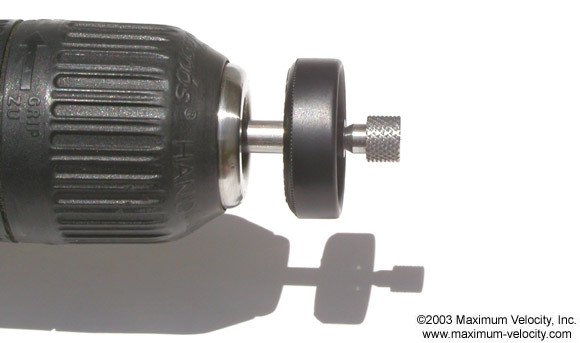 For a hand drill, drill press, or lathe, tighten the chuck on the wide part of the mandrel body. For a Dremel-type tool, tighten the chuck on the small body shaft. Mount the wheel with either side of the wheel towards the step-down face of the mandrel. Generally, work is simplified by mounting the spoke-side of the wheel towards the step-down face. Hand tighten the screw snuggly (don't over tighten).